I never thought a book about tidying would make me tear up and smile. I felt my fingers grasp the last few pages and my eyes locked on her last bolded point. She concludes that life is about more than tidying. We are here to pursue our passions. And that made me cry a little. Because, as a person with too much, I thought about the times I’ve convinced myself to say no to opportunities because of the lingering cloud of clutter at home. “I need to clean first,” I’d think to myself. Cleaning and organizing were taking precedence over much more important things. I remembered the times I could have practiced hospitality but was too embarrassed at the condition of my home. I reenacted in my mind all the times I’ve wanted to change my habits but felt so overwhelmed in the heaps that I just laid in bed staring around me, clueless on where to begin. I needed to admit to myself that clutter does affect my life choices and feelings. 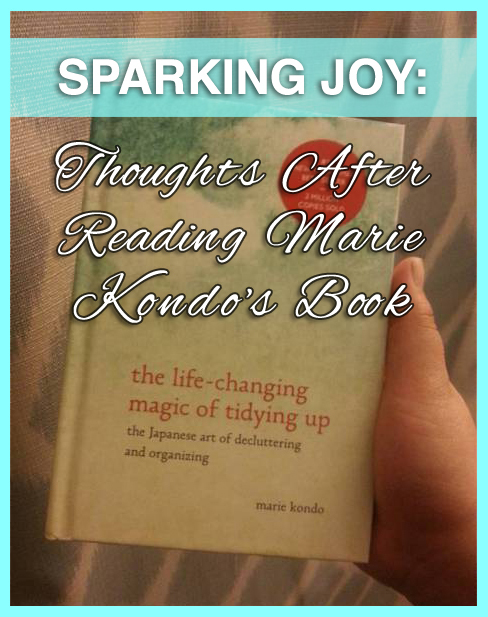 Marie Kondo’s book is a happy blend of anecdotal experiences both personally and professionally, and an instructional way to rethink your objects and life. She claims that tidying, when done right, does not need to be practiced little by little, but rather, after implementation would be an annual event at most. Her method “KonMari” asks people to tackle their belonging all at once. The reason, she explains, is that once you see the dramatic difference tidying makes, you will feel a sense of accomplishment and not want to revert to old habits. And, as one would expect yet dread, she says an important first step is to DISCARD. I love that her advice for what to keep and what to discard/donate is as simple as asking one’s self, “Does this spark joy?” It’s not about having a magic number of things or turning hangers a certain way, it’s about being surrounded by only items you truly adore. No more half-hearted clothes, books, kitchen and office supplies, etc. I like that this allows one to express themselves how they see fit while being real about the whole situation. It helps people appreciate what they have, and conversely, consider before a purchase if an item they are about to introduce to their home is something that ranks that high in joy. In return, there are less purchased items and no settling for the mediocre. If items aren’t doing their job, they shouldn’t be kept or bought. It would be a disservice, for example, to buy a skirt that doesn’t flatter me or needs to be worn with only certain types of outfits to conceal my tummy because it’s tight in the waist or only worn with pantyhose because it’s uncomfortably short otherwise. No more exceptions. In return, my outfits choices will flatter me better without the pile of combinations I had to try on before to look “just right.” This also means that one may need to alter the amount they own for their living space. A crowded living space would not spark joy. And for certain individuals like myself, a sparse home would also lack joy. Kondo says there is a “click point” where you’ll know you have just enough and will keep belongings around that number throughout life. – Tackle your home one category at a time…start with clothes and following her list, work your way to mementos. – Take out EVERYTHING from its place and handle it one by one to see if you get that spark. – Vertical storage helps you visually see what you have so nothing gets lost. – Visualize and give purpose to your tidying. What is your aim and how does it allow you to live more fully? I particularly enjoyed what she said about giving items away or passing them down to family. Ask them “What do you need?” And, when offering, tell them to only take what they would spend their money on in the store. This way nothing is accepted with the guilt of knowing it would be trashed or donated otherwise and you do not encourage clutter in their lives. The only point I cannot agree with is books and photographs. I have already found from personal experience that pictures I once hated I have now embraced in hindsight. I find that since pictures these days are digital files, it is easy to delete duplicates and only print out ones that spark joy. She also recommends tearing out important words from books that no longer serve a purpose or spark joy but have words or a quote you want to remember. All I could think was, SACRILEGE! No, I do not agree with torn pages. That makes a book incomplete and does not seem to be a thankful gesture for the information it imparted. You also cannot donate a book with pages that are torn out. It makes something that was perfectly useful no longer useful to anyone. My compromise *cough*-suggestion-*cough* is to scan it now that they make scanning wands OR buy the ebook and screen capture the parts that stood out to you. Please do not kill your books. It would make me cry. I also feel it important to address the “animistic” way she discusses objects in the book. I personally believe it is about reverence for what you have. She is adamant about thanking your belongings for serving you. Bloggers are unrightfully crediting this to her Shinto beliefs but on a Reddit AMA, she clearly states she is not particularly religious, and that Shinto practices are interwoven into Japanese culture. I wanted to note that to represent her fairly. I think that if we can be considerate of our objects and be grateful for them, whether or not you want to address them as living things, we are more respectful, caring, and mindful of what we have. I translated this portion into being thankful for God’s providence and blessings as I am religious. You may translate it differently depending on your beliefs or lack thereof. I am so grateful for this book and can’t wait to change my lifestyle and shopping choices. I’m ready to live more purposefully and be surrounded by things that spark joy.